It’s the perfect setting for her business. 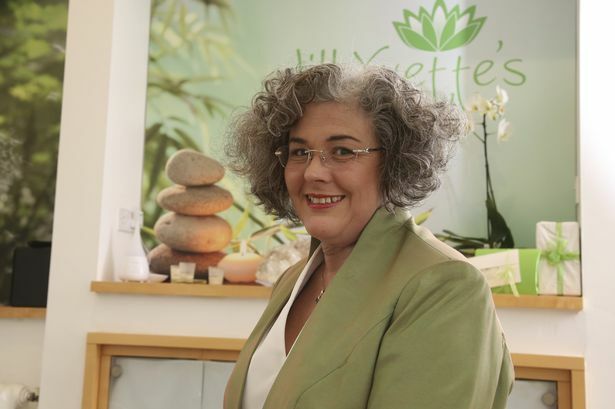 Jill Yvette Painter couldn’t be happier with her premises at tranquil Lockwood Park – and clients of her business, Jill Yvette’s Holistic Beauty Ltd, share her opinion. Jill’s business occupies part of the former stable block at Lockwood Park. She has converted a boardroom used by the previous occupants into a welcoming consulting and treatment room. A large picture window has been replaced with something smaller and more suitable for private consultations and a water supply has been laid on. New flooring has also been laid over the original stone flags. Jill said she had been looking for new premises for some time after running her business at Crosland Moor. “I saw this place on a Wednesday, said ‘yes’ to it on the Friday and went to Thailand on the Sunday for two weeks to attend a family wedding,” she says. Jill was brought up in Fenay Bridge and attended Almondbury High School and Greenhead College, where she studied maths, biology and domestic science. But she says: “I always wanted to do this kind of work ever since I was 11 or 12. Jill attended a 12-month course in beauty therapy at Nottingham, qualifying in 1981. Her research led her to investigate holistic methods of beauty treatment and skin care, which she now uses as part of her range of treatments. They include her unique ‘I Wish…’ treatment which combines beauty therapy with holistic methods to help tackle skin problems, signs of ageing, stress, aches and pains and lethargy – and help clients achieve younger-looking skin, increased energy and vitality and make a fresh start in life. “I find now that I can really specialise in the things I like to do,” says Jill. Jill’s 32-year career began with her first job working for hair and beauty salon Steiner in Leeds. From there, she joined Ralph Cuthbert in Huddersfield. The business was principally known as a retail chemist but also had a salon at Greenhead Road as well as its own Lady Esther range of beauty products. Jill helped run the salon for some years before launching Jill Yvette’s in 1984. “I bought the salon from Ralph Cuthbert,” she says. “I had always wanted to have my own place and build up my own little empire! “I had about half a dozen staff there, but eventually it became a bit too much because of health issues. “The most important part of the business for me was working with the clients. Hunting for new premises, Jill hit upon the Lockwood Park site. “I came by this place almost by accident,” she says. “I had come to look at another site, but that had gone and these premises became available. “I opened for business on May 8 this year and had a formal open day launch in June. Clients range from young girls who need advice about how to apply make-up for the first time and young adults who need treatments for skin problems to busy mums looking for relaxation therapy and older women seeking treatments to care for ageing skin. Jill has built her reputation on client recommendation and repeat custom – while she spreads the word about her business via social media. Jill is also a qualified reiki practitioner and runs reiki sessions as well as providing training in reiki techniques to small groups of students. Jill says helping her clients – and seeing their confidence grow as a result of her treatments and skills – is the biggest reward. “I can get people coming in who are feeling a little bit down and depressed,” she says. Jill, who lives at Linthwaite with husband Mark, has her own ways to relax. “I like to go driving or walking over the tops,” she says. Although she’s holidayed in Australia and Thailand, Jill says she can be just s happy taking the sea air at Whitby. If Jill has one regret in business it’s what she sees as a lack of help for other would-be entrepreneurs. “When I was developing ‘I Wish…’ I got a lot of help from Business Link. Business tip: If there’s something you don’t like doing – and keep putting off doing – there’s always someone else who can do it and make a better job of it! Never stop learning.